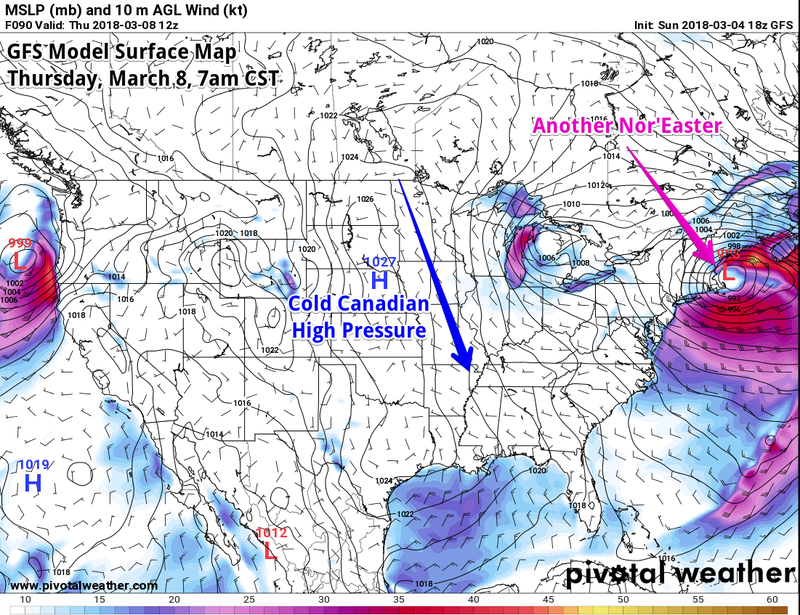 MWN Blog: Typical early spring week ahead - warm rain, cold sun, then warm rain again! Typical early spring week ahead - warm rain, cold sun, then warm rain again! The past few days have reminded of how beautiful early spring can be in the Mid-South! Crisp mornings have given way to mild afternoons as highs have reached the 60s. Outside of some afternoon clouds today, sunny skies were a welcome sight after deluges to end the month of February. Unfortunately, a beautiful weekend leads to a rainy Sunday night and Monday, but at least rainfall amounts will be "tolerable" as compared to, well, seemingly every time it rained last month, but especially earlier this week! With 4.64" of rain in less than 48 hours - from Tuesday evening through Thursday late morning - February rainfall shot into the record books with an official total of 13.43" - more than 2" higher than the previous record set in the late 19th century! Total amounts over the next 24 hours should be in the 1/2" range with the steadiest rainfall occurring from around midnight tonight through rush hour Monday morning. Scattered showers, and a possible afternoon thunderstorm, are expected Monday until a front arrives in the early evening to bring the rain to an end. Behind the departing system, Tuesday looks decent with mostly sunny skies and highs in the lower 60s, though a brisk northwest wind is a harbinger of things to come in the temperature department. Reminding us that cold spells in early March are not rare, the mid-week period will feature highs barely above 50° and lows dropping close to freezing in the city and likely below freezing in rural areas. Hopefully not much damage is done to budding plants and flowers that have flourished on the above average temperatures and abundant rainfall in February! 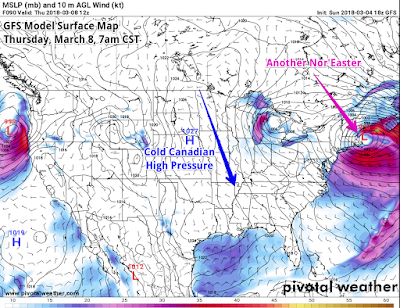 Be watching for national weather news to feature another significant storm for the northeastern U.S. during the mid-week period, which will help to drive that colder air on its western flank down into our region! As we get towards the first weekend of Spring Break for many, the thermometer starts to climb again, but so do the rain chances. Early indications are that next weekend could be a wet one once again. Yes, another potentially wet Saturday that have come far too often this year! I hope you enjoyed this weekend! While significant land-based flooding was avoided during this past week's heavy rain, the rivers are high, and climbing. 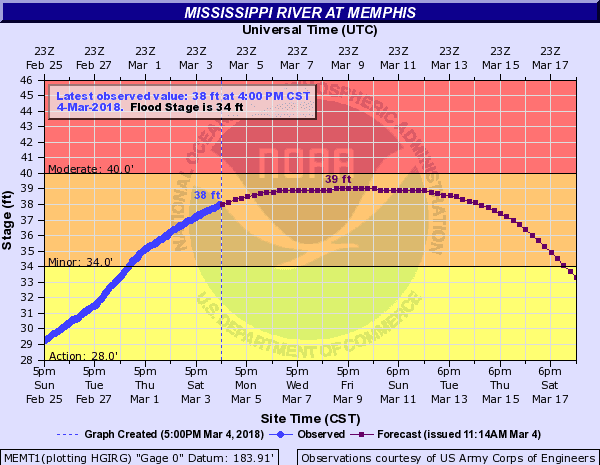 On the Mississippi River at Memphis, where flood stage is 34', the river is at 38' as of 4pm and peaking near 39' over the next few days. It is projected to remain above flood stage for at least the next couple of weeks. For comparison, this crest would be just short of the 39.6' crest reached in 2016, but well short of the 48' it reached in 2011 when national media "waded" in the river at the foot of Beale Street. However, if the river rises a few inches above the projected crest, which is possible, this year's spring flood would rank in the top 10 historically at Memphis. Water levels on tributaries like the Looshatchie and Wolf Rivers will remain high the next couple weeks as high water levels on the main stem don't allow these feeder rivers to empty. Overall, the week ahead doesn't look too bad, book-ended by rain chances and with a dip in temperatures mid-week. It looks a lot like an early spring forecast! Follow us all week on social media as we provide updates every day on Facebook and Twitter. 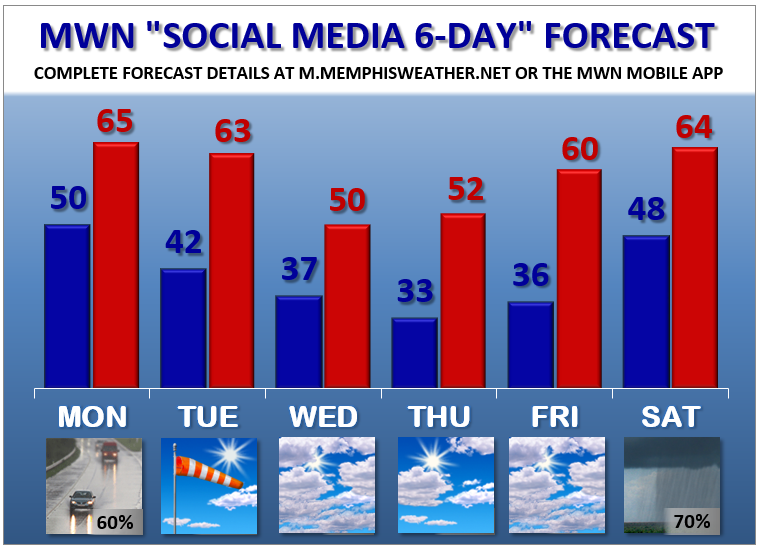 Also be sure to download the MemphisWeather.net mobile app for the latest conditions, radar, and most recent update to the human-powered MWN Forecast. All links are below.